Around the world there are over 500 species of rays. Related to the shark family these cartilaginous fish are of extreme value to the recreational angler, from both boat and shore. Sadly though, the numbers of rays being landed either commercially or for sport has dwindled vastly over recent years. It is a fact that the common skate one time abundant in most UK waters is now listed as an endangered species. According to the Shark Trust there have been 15 species of ray recorded in UK waters, of these only 5 of them are relatively common around the north Wales coast. These are the blonde ray, cuckoo ray, spotted ray, small eyed ray and thornback ray; the thornback being quite possibly the most common of all to the recreational angler. I have occasionally heard reports of small undulated rays being caught around the Nefyn area, but none of any size. A wide held belief is that the rapidly declining stocks of rays (or is that fish!) can be attributed to the over fishing from our commercial brethren. Yes, a belief I also hold, however are they not simply making a living (I am now ducking for cover). We are all entitled to this and with a market for rays, an abundance of the fish at the time, and no sustainable program for the species was this not simply a recipe for possible disaster. A number of years ago now the South Wales Sea Fisheries Committee imposed a minimum size on all rays caught, this currently stands at 45cm wingtip to wingtip. The minimum size list also states 22cm for a single detached wing, how many single winged rays have you seen caught? What is alarming though, is that the North West & North Wales Sea Fisheries Committee has no minimum legal landing size for rays on the list!! The Shark Trust is a conservation charity that is dedicated to the study and conservation of sharks, skates and rays. You can learn more of their work and how you can help by visiting the website at www.sharktrust.org . On Thursday13th April 2006, the Shark Trust along with Denbighshire Council will be staging the Gronant Dunes Easter Egg case Eggspedition. Starting at 1.30pm from the Lower Gronant car park, (opposite the Crofters Pantry Cafe) this is an excellent opportunity for adults and children alike to explore the beach at Gronant Dunes looking for skate and ray egg cases. Here you will be able to learn about these fascinating animals and help identify the egg cases for the Shark Trust’s records. For further information please call Denbighshire’s Biodiversity officer on 01824 708234. Rhys Llywelyn from the WTB with a 13lb blond ray. Catching a ray is an exhilarating experience. After the take you then proceed to battle with the equivalent of a large sack, or dustbin lid in the tide. Tired arms and the distinct need for a cup of tea though is soon forgotten when you catch a glimpse of these majestic looking fish gliding towards the boat on the surface of the water. 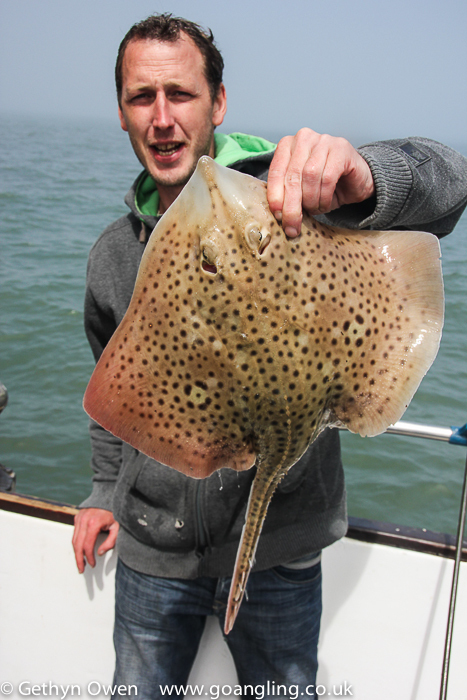 Rays can be caught around most of north Wales, with certain species being more prevalent in certain areas. Thornbacks, not as abundant as previous years are still caught regular along the north east coast around Conwy and in the Rhyl area. These and all the other common to north Wales rays can be caught on the North West coast, especially around the Isle of Anglesey the cuckoo ray however is slowly becoming a rare catch. In north Wales, the rays first show signs of moving in during the last week of February and the first week of March. 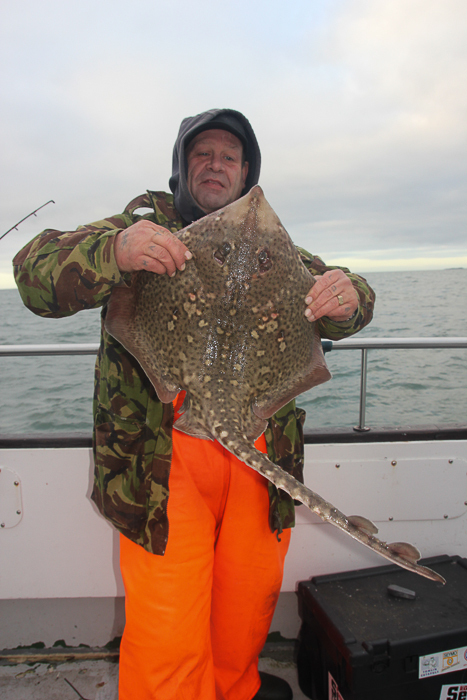 By mid March and through April good ray catches are expected with bigger fish the norm. This is owing to the female of the species moving close in to lay their eggs. 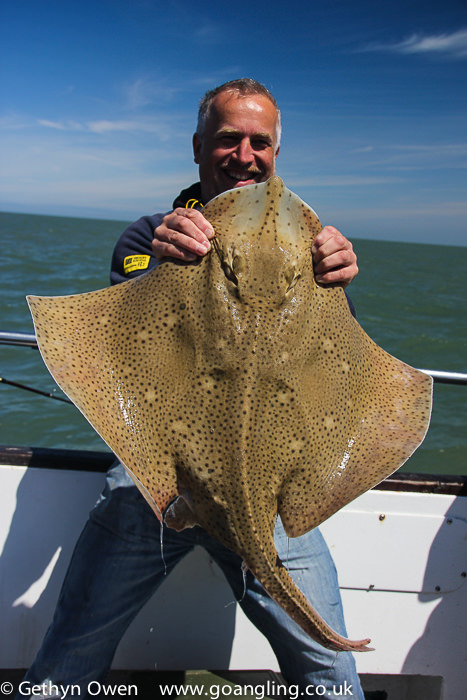 Last year the largest ray aboard My Way, caught mid March was a blonde weighing 18lb 14oz. On landing it had an egg case already on the way out, thus the ray was quickly photographed and released. Around Anglesey the vast majority are taken close in on the broken grounds. Marks such as Ty Croes and Cable Bay are renowned for thornbacks, spotted rays and the odd small eyed; both of these marks on the south facing side of the Island offer exceptional fishing from either shore or boat. On the north east tip of Anglesey you’ll find Whitebeach, again accessible for both shore and boat anglers a popular ray mark. 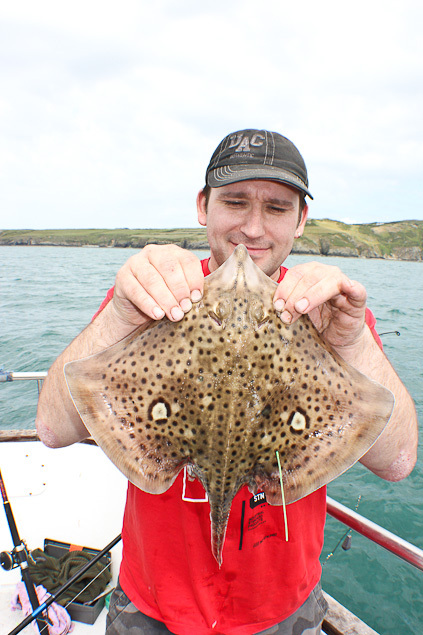 Directly north of Holyhead around the mussel beds and Langdon Ridge blonde rays and some very nice spotted rays can be caught. 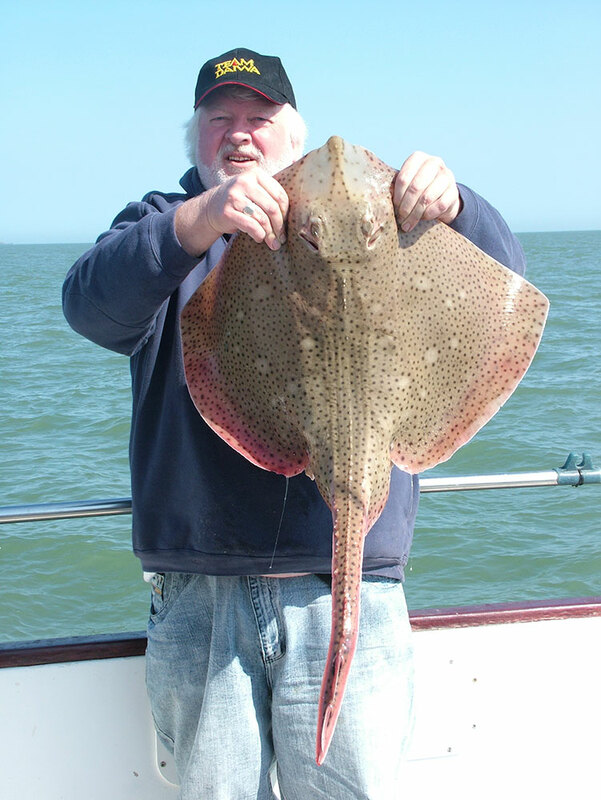 Uptiding can be a very productive method of fishing for rays, especially when in fairly shallow waters. This helps get your baits away from the noise from around the hull and ensures that your baits are anchored firmly on the ground for a ray to find. Rays will take a variety of different baits including mackerel, sandeel, squid and also peeler crab. My preferred ray baits and those that I have had most success with are whole squid or squid and sandeel cocktails. One of the main problems when targeting these fish especially on more of the broken grounds is the scourge of the dogfish. So often you can take time preparing your hook baits to have them snaffled by a marauding doggie. This is one reason I tend to stay away more from using mackerel, having said that a fresh whole fresh mackerel fillet, topped off with a nice piece of big calamari really does work a treat. For your rig, a simple running ledger using either a single hook or pennel rig will suffice. Don’t skimp on the line though, Rays have extremely powerful mouths and will make easy work of a light trace. Mono between 50lb and 80lb using hooks between 3/0 and 6/0 will help concentrate your efforts to landing a decent ray. Ray bites are far less obvious than what you might consider for such a fish. Bearing in mind that the mouth of the ray is on the underside of its body, it needs to settle upon your bait to take it. At a first glance a ray bite may look no more than your line being pulled down slightly in the tide, occasionally with a small rattle of the tip, which you would normally shun as irrelevant or pesky crabs. As the fish settles more on the bait, normally the rod tip may bend further as more line is taken down by the large wing or body of the ray. If you haven’t picked up by now intrigued by the strange reactions of your fishing rod, you soon will as the ray makes a dash for it, complete with hook in mouth.